Visually, the ModKat top entry cat litter box is a sleek, sophisticated beauty. It’s pleasing design is also functional: It helps reduce litter tracking, keeps unpleasant views hidden from sight, and helps to reduce odors that might otherwise float around the room. The top entry design also helps discourage children and other pets from getting into the litter, possibly eliminating the problem all together. 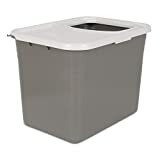 Below are ModKat top entry litter boxes for sale on Amazon and eBay. For more information about this litter box, please scroll down the page. 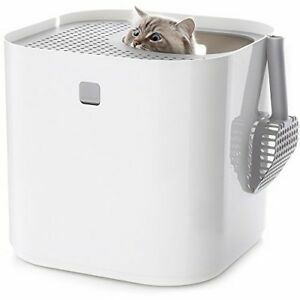 The ModKat Top Entry Litter Box. From Amazon. Please note the litter boxes below from Amazon and eBay are mostly the ModKat brand, and mostly Modkat’s top entry style. 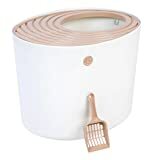 However, there might also be other brands of litter boxes, and/or other styles by Modkat, and/or accessories. Also, when comparing prices on the ModKat top entry litter box between Amazon and eBay, be sure to factor in shipping! Shipping may or may not be included in the prices shown so always check to be sure! 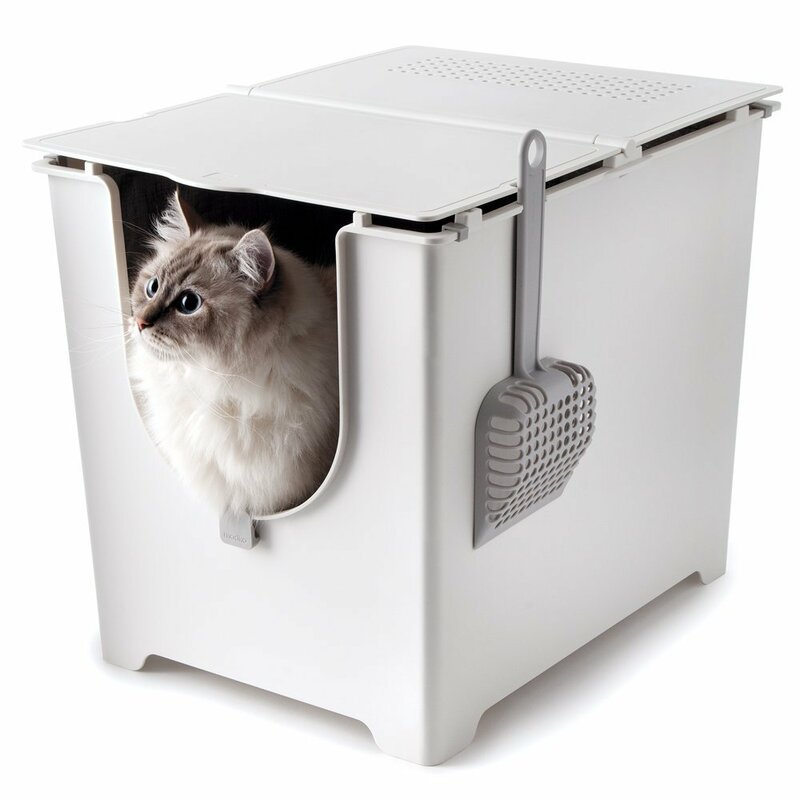 The Modkat top entry litter box allows your cat to enter and exit from the top. As they exit across the special lid, litter clinging to their feet falls off right back into the box, virtually eliminating litter tracked across your floors. The lid also has a special swivel design, that, when rotated, allows any remaining stray litter to also slide back into the box. 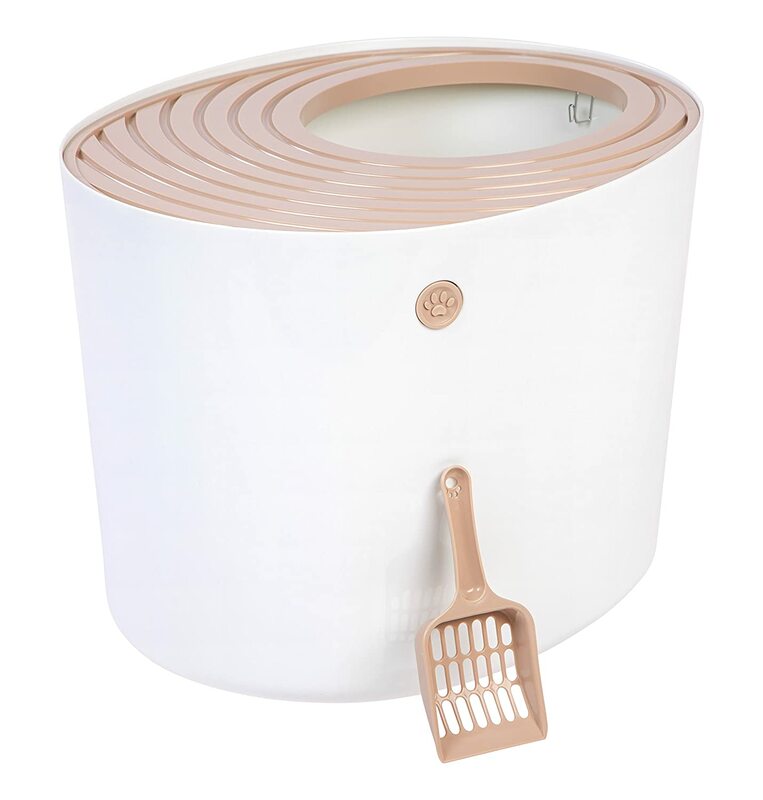 The Modkat top entry litter box can also reduce the amount of floor space needed: Since it is so effective in catching litter, many cat owners don’t feel the need to also use a litter mat on the floor, reducing the amount of floor area devoted to the litter box. Entry is approximately 9 inches in diameter. Box dimensions: 16in x 16in x 15in tall. Liner dimensions: 16in x 16in x 10in tall. Its locking lid acts as a walk-off mat to keep litter off of your floors, and swivels open to dump any stray litter back inside. The locking lid is also easily removable. The Modkat scoop (included) has an ergonomic handle for effortless scooping and a contoured front edge to match Modkat’s shapely curves. After clean-up, it neatly hangs from either side of Modkat for convenient storage and access. The reusable Modkat tarp liner (included) is resilient to scratching, easy to clean, and is tailored to the interior, remaining out of sight. 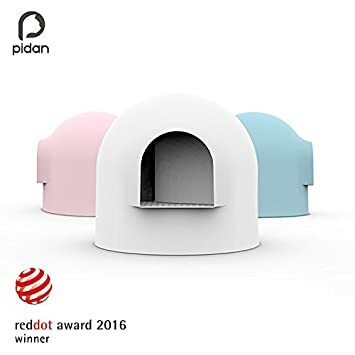 The Modkat top entry litter box was a 2010 recipient of the Red Dot Design Award in 2010, being recognized for outstanding innovation, design and functionality. Modkat was selected from more than 12,000 submissions representing 60 countries. A full height seamless base to prevent leaks. An easy open swivel lid, which is also removable. A reusable tarp liner for effortless litter removal. 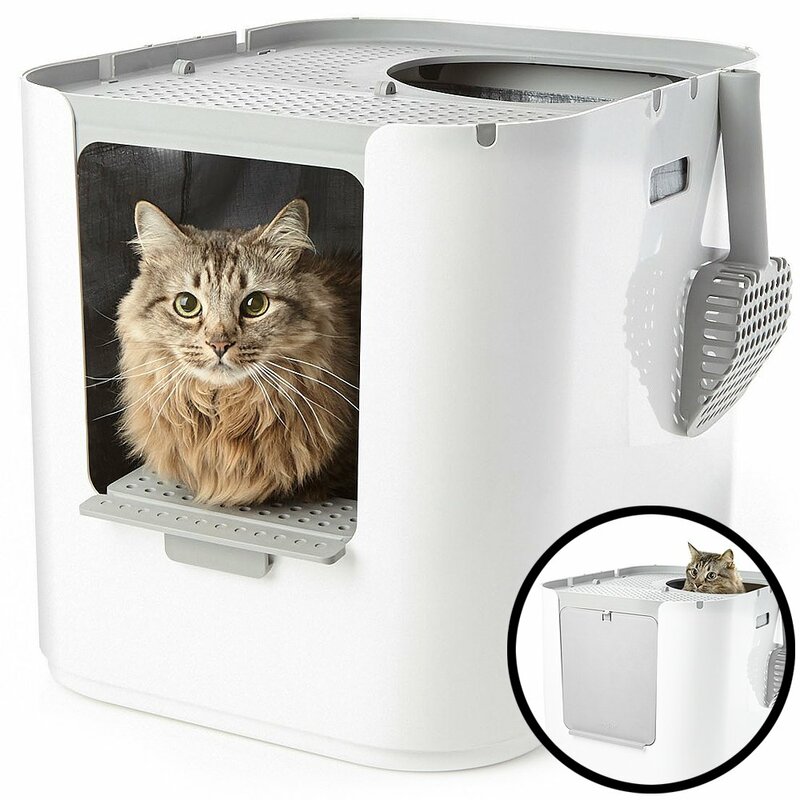 This short video (1:13) gives a good look at the Modkat top entry litter box along with a nice description. This next video has a long intro, but about halfway through it gives another look at the Modkat top entry litter box.